Germany is sending out officials all over the place to encourage professionals to move to Germany. Most Ministers are busy making statements on “Foreigners being the future of Germany”. They have even set up websites to help encourage foreigners move to Germany, but something isn’t right. The undertones that many seem not to have understand is that, although foreigners are needed in Germany, only those with degrees or other tertiary level of education are WANTED. I wrote an article on the Double Standards of German Immigration Policy. If you have no degree, they don’t want you in Germany, it’s that ugly but true. 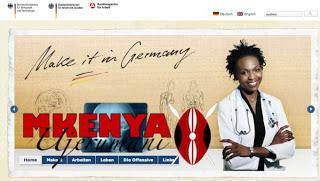 A good example is the German website aimed at foreigners “Make it in Germany”. It has images of foreigners who say they’ve made it from an African medical doctor to a Chinese mechanical engineer but what of the foreigners with no degrees? Well, when you visit the site they offer a Quick Check to find out: What are your chances, as a qualified professional, of immigrating to Germany to continue your career over here? 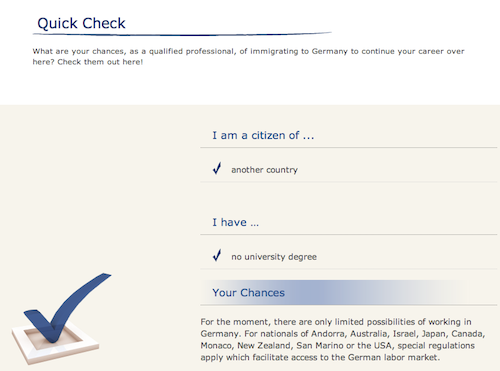 But when you give in your country of origin as outside the EU and then click on the option for those without a degree, you get the rude shock: For the moment, there are only limited possibilities of working in Germany. Is this part of the double standards? Selling Germany as an open country but in reality only hunting for “useful” foreigners and not just foreigners?